Oversize trucking permit calculator and cost estimator software tool. WideloadShipping.com is working on a new software program designed to assist in calculating oversize trucking permits. The program is for dispatchers and sales personnel to use in calculating state permit costs for OD and OW (oversize and overweight) loads. While many industry experts are able to do permit fee estimates on the fly based on years of knowledge they have in the industry we’ve noticed the emergence of a new generation of people entering the OS/OW field that are in need of an oversize trucking permit calculator. In order to accurately bid potential shipments in a timely fashion this will help them immensely. The software program will have many features but primarily will be used for the estimation process in bidding. Providing a guide for the total estimated cost of each state trucking permit needed in order to successfully ship a load across single or multiple states. This tool will be available to use for free online. Simply select the state you wish to check permitting costs in and enter the load dimensions. Select submit and it will give you a final number based on the information you’ve entered. This is primarily for oversize shipments focusing on loads that are over-height and over-width. Over-weight shipments can require much more detailed information with many different variables for many different states. Each state has a different fee matrix for heavy haul shipments depending on their weight and in some states even intended route of travel. So the tool is primarily targeted towards entry level users in the industry until they can more easily estimate permit costs in each state. 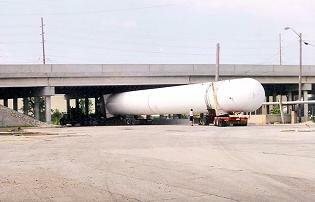 Heavy haul shipments require more in-depth research for permitting purposes as they are much more expensive in most cases. The tool is expected to be released sometime in mid October and will be easily accessed from the main page of the website. Need assistance in estimating the cost of trucking permits for a shipment you are working on? Feel free to contact our permitting department for assistance.